Ulster full-back Jared Payne has been handed a two-week ban following his red card for tackling Alex Goode in the air in the Heineken Cup loss to Saracens. The suspension means Payne will miss Friday's Pro12 game against Connacht and the 18 April match with Glasgow. In the pivotal moment of Saturday's game, Payne was sent off by referee Jerome Garces after only five minutes for his challenge on full-back Goode. Ulster's 14 men were eventually edged out 17-15 by the Premiership leaders. 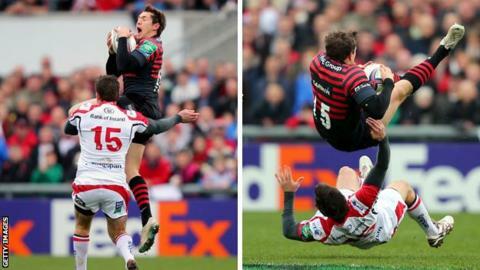 Payne, 28, was sent off after running into Goode while the Saracens back jumped to catch a high ball at Ravenhill. Goode was forced from the pitch with concussion, playing no further part in the game, and referee Garces dismissed Payne after watching replays of the incident on the big screen. Payne was charged with contravening two separate laws and could have faced a suspension of at least five weeks if he had been found guilty of both offences. With Ulster currently in the midst of an injury crisis, the Ravenhill management will be relieved that the soon-to-be Irish-qualified New Zealand native has escaped a longer ban. Rory Best and Ruan Pienaar look likely to be ruled out for the remainder of this season while Dan Tuohy, Roger Wilson, Andrew Trimble and John Afoa are also currently on the injured list. The independent judicial officer, Simon Thomas, heard evidence and submissions from Payne, Ulster's director of rugby David Humphreys, Ulster team manager David Millar and European Rugby Cup (ERC) disciplinary officer Roger O'Connor. In upholding the red card decision, Morris determined that Payne had committed a reckless act but concluded that the offence was at the low end of International Rugby Board sanctions for offences of this nature and decided to impose a three-week ban. However, Morris reduced the suspension to two weeks because "there were no aggravating factors, and taking into account the player's clean disciplinary record and his exemplary conduct at the hearing".